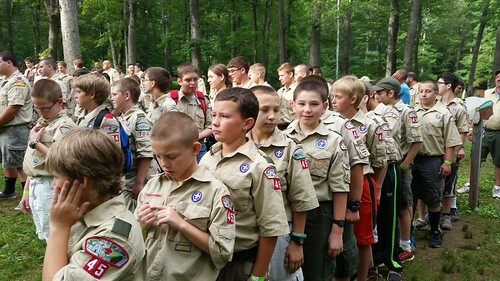 16 boys, 41 merit badges, 2 adult leaders, 6 nights and 160 scouting friends came together to make our 2014 Scout Camp at Seven Mountains a memorable week. I can’t begin to tell you how proud I am of our scouts. These boys managed themselves through the week, from handling their in-camp duties, performing daily flag ceremonies, making sure everyone showered, getting to their merit badges on time and generally working together with awesome scout spirit. This is the first year I can remember where every boy earned all the merit badges they attempted. That’s right, there wasn’t a single incomplete merit badge. That takes dedication on the part of the boys, ranging from getting their prerequisites done to doing homework in camp. They managed their time wisely and it paid off for them. One of the week’s highlights for me was seeing two of our boys go from non-swimmer status to passing their BSA swim test! One of the boys had never put his face in water, before! But with the help of a swim instructor from out of council (thanks, Heather!) both Justyn and Zeb learned to swim and passed their tests this week. Very well done, boys! While camp started out kind of soggy, we still had a good time. From Sunday through Tuesday, we huddled under the new pavilion at Leopold. At night we played Farkle and Rummy. We did Thorns and Roses under the lantern, and we enjoyed each other’s fellowship. During the day, most classes were held under a covered roof, except for aquatics. But by mid-week, things started drying out and camp became beautiful with weather in the mid-70s. On Wednesday night, Taylor, Chad, Caleb and Greg were tapped out at the OA ceremony. We’re really proud of them and hope to see them take their Ordeal very soon. Just prior to the ceremony, we got to hang out with the scout families and enjoy their company over dinner at our camp site. Overall, it was a pretty good day. By Friday, things were wrapping up. The boys finished qualifying for Archery (but not rifle – most of them did that the very first day – we have some real marksmen in the troop! ), completed demonstrating their swim strokes, and even participated in a camp wide search and rescue exercise which was led by our very own Senior Patrol Leader, Jon. During the exercise, and later at the campfire, Nick received special kudos for his exceptional patient care during the first aid portions of the drill. Overall, camp was awesome and we can’t wait for next year. Great job, boys!